As a former Division II soccer player, Ryan Peck thought he knew everything about staying on top of the ball. Then he entered the MBA in Sport Management program at Florida Atlantic University and found himself challenged in a way that made wind sprints feel like a cool breeze. "I thought soccer and classes took a lot of time management, but this really tested me," said Peck, who graduated the FAU program in 2011. "It wasn't easy, but it really prepared me for a career in collegiate athletics and ultimately helped me to be successful." 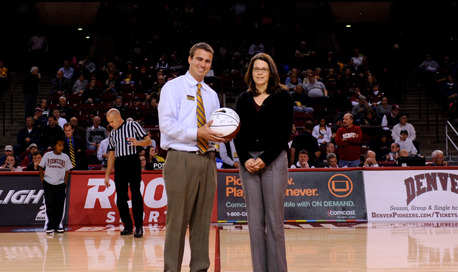 And talk about scoring: Today Peck is the associate vice chancellor for external affairs at the University of Denver. It's a job he was promoted to in the last year, and his responsibilities include serving as a liaison to CBS Sports. "I'm one of the luckiest people in the world when it comes to my career path in sports, and I credit a lot of that to the time I spent at FAU," Peck said. He gives special praise to Jim Riordan, a clinical assistant professor and director of the MBA in sport management program. It's no stretch to characterize Riordan — a veteran of the Philadelphia Flyers and New York Mets organizations — as a championship coach in his own right. Thanks in large part to his tenacity, FAU's MBA in Sport Management is currently ranked No. 5 in North America and No. 6 in the world by SportBusiness International. But contrary to what many might think, Riordan has no room for fanboys in the classroom. "You have to look at yourself in the mirror and ask, "˜Can I be a sports business student over a sports fan?'" he said. "A lot of people think they might get to sit in the press box next to Jerry Jones and watch football all day. The reality is that for about every Jerry Maguire, there are 50,000 or 60,000 people who want to be that." And so the MBA in Sport Management breeds winners of another kind: graduates prepared to succeed in the worlds of sports and entertainment. The MBA in Sport Management is accredited by the Association to Advance Collegiate Schools of Business. "It's the highest accreditation a business school can have, and only 5% of schools have it," Riordan said. Peck remembers when he interned for the Miami Heat and worked full time on corporate sponsorships for FAU's athletic department. "At that point I was working 40 hours a week, and during the peak of it I was in class three to four nights a week," he said. "Then there were 90 athletic events we tried to help out with, along with going to classes, doing the homework, writing papers and preparing presentations." Peck sounds exhausted just looking back at the work he did. "It was tough," he noted. "But I wouldn't have had it any other way. It's helped me to get where I am today." Riordan is equally demanding of FAU's teaching team. He not only requires his faculty to have a rich sports business background, they also have to be in the game, so to speak. "The average is about 25 years' experience and they're all still in the industry," he said. The MBA program has produced more than 120 graduates in 15 years. It's selective but holds incredible promise for graduates. The school works with students to help them achieve their dreams. "We had a student who was scheduled to graduate in May, and in February the New York Yankees hired him as a corporate account executive," Riordan recalled. "We have it set up that students who get a job before graduation can complete their coursework online, and that's what he did. He completed everything in the syllabus but he couldn't attend the graduation." "He had a game that day," Riordan said.